Here is our lovely list of stallholders for the January Market – this Sunday 5 January from 9am-1pm. There will be live music from our brilliant buskers, face painting for the kids by Aimee from Wonderpaint and plenty to taste and buy. Make a note in your calendars for next month as well – we will be having a “JAM Session” at the February Market – with a jam making demo for the grown ups and a musical instrument Jam Session for the kids – stay tuned for more details as the February market approaches! Community Stall – The BCFM Community Stall has an ever-changing variety of fresh, locally grown produce – make sure you check what is available on the day and think about contributing some produce of your own! JW Kirkwood Orchard – beautiful, fresh cherries. 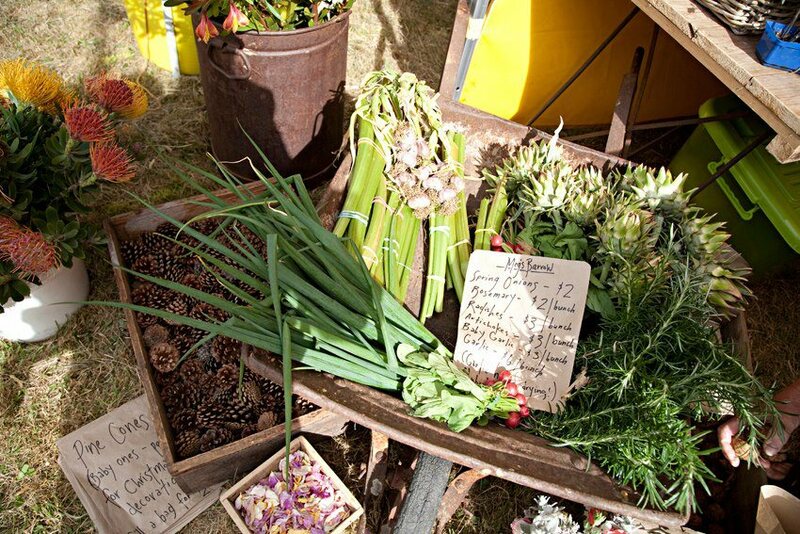 Marion Bay Organics – Pat and Kat Burke will be selling purple garlic and rhubarb, grown locally, and completely chemical free using organic processes. Richmond Cherry Farm with their fresh, locally grown fruit. Coledale Walnuts – locally grown walnuts from the Coal River Valley. Westerway Raspberries – top quality raspberries, jam raspberries, blackcurrants, redcurrants, apricots and pink eye potatoes. Leap Farm – sustainably and locally raised goat meat products with the lowest food miles possible, and this month Leap Farm will also have local beef mince for sale and will be taking orders for other beef cuts. Pirates Bay Berry Farm – Sue will have her incredible range of jams, sauces and chutneys for sale – not to be missed. Beanyard Coffee – hot coffee using beans roasted in Tasmania, and this month Beanyard will also be selling refreshing iced tea. Dunalley Primary P and F Hut – the wonderful parents and friends of Dunalley Primary School will be cooking up a storm with fabulous brekkie items, snacks and lunches. All money raised goes back to the school. Sarah Wavell-Bird – will be selling her live young chooks. « The Community Stall needs YOU!